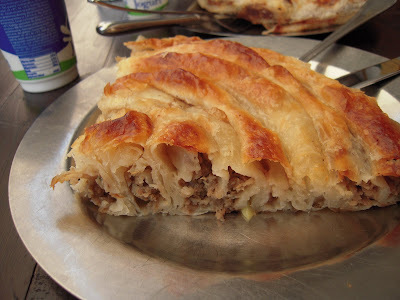 Let's bring our Bosnian extravaganza to a close with some musings on burek, one of my favorite street foods. 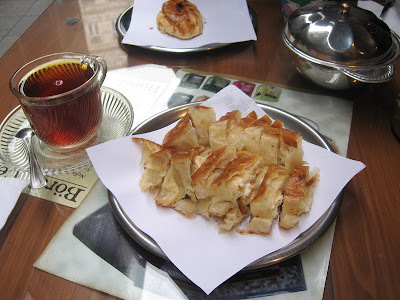 Back when this blog was beginning we were spending a couple of months in Istanbul, and our breakfasts often meant heading down to the local börek baker and ordering tea and a slice of the flakey pastry filled with meat known throughout the former Turkoid world as börek. In the Balkans, the word morphs with various spellings into burek. 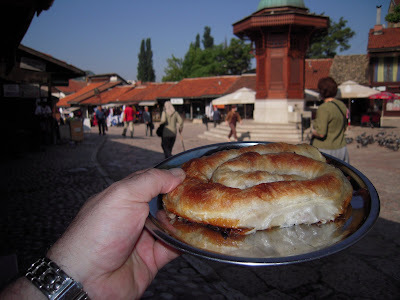 And Sarajevo has some very good burek. 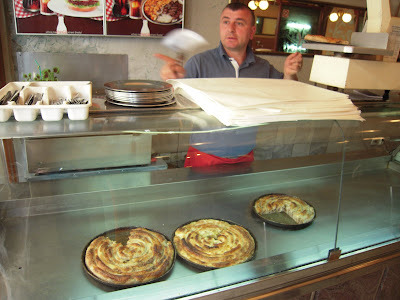 The winner of the burek competition was a tiny place on a side street in Bascarsija simply advertising "Sac Burek." 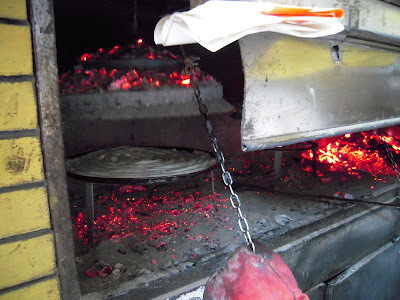 Sac is turkish for a charcoal grilling process in which a large metal pan is filled with coals and hung above the burek to bake it from above - kind of a dutch oven idea but adapted from the older Anatolian tradition of baking layered flatbreads without a real oven. 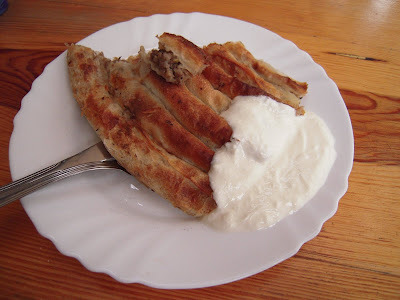 The burek pastry is called yufka, just as in Turkey, and is made by preparing a simple dough of flour and water and then soaking balls of the dough in oil for a few hours. The resulting dough is shiney with shortening and, beaten out, becomes elastic. Rolled and tossed until it is a thin and translucent parachute, the yufka is filled with meat (classic burek) cheese, potato, or spinach and cheese and rolled into a coil and baked. At the Sac burekdzinica it was served with a side of thick clotted cream. Breakfast doesn't get better than this for one Euro. 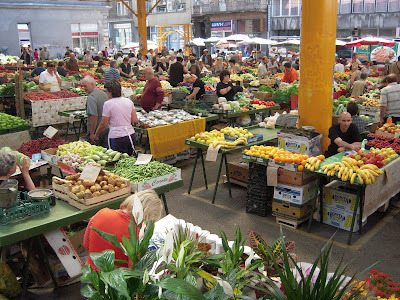 The best part of staying in the Bascasija district was the convenient access one had to amazing, high quality cheap eats. Wake up, drag self down to street, start drinking coffees and fresh orange juices and grab a slice of the world's best burek for next to nothing. Practice speaking a barbaric mixture of agrammatical South Slav mixed with Turkish with the owner, usually on the topic of Turkish football. "Turkiye? Dobro. Besiktas? Mnogo dobro. Moje team. Cok iyi! Super!" Continue throughout the day. The Markale was the site of one of the final atrocities of the Siege of Sarajevo.The first happened on February 5, 1994 when 68 people were killed and 144 more were wounded when a Serb mortar was shot into the Market from the hills above Sarajevo. The second occurred on August 28, 1995 when a mortar shell killed 37 people and wounded another 90. This latter attack was the stated reason for NATO air strikes against the Bosnian Serb forces that would eventually lead to the Dayton Peace Accords and the end of the war in Bosnia and Herzegovina. 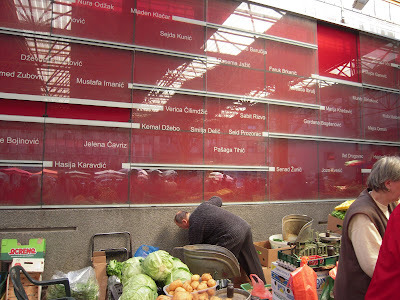 Today the market is thriving, and a wall in the rear of the market honors those killed during the bombings. The bombs were indiscriminate: Muslim Bosniak names rest beside names of obvious Serb and Croat origin as well. The monument was one of the more moving that we sawe in Sarajevo - life goes on, yet no one forgets the victims. On our way out the next morning, we passed destroyed villages in the northern part of Bosnia where the present day invisible dividing line separates the Muslim Croat Federation of Bosnia from the still isolated Republika Srpska. 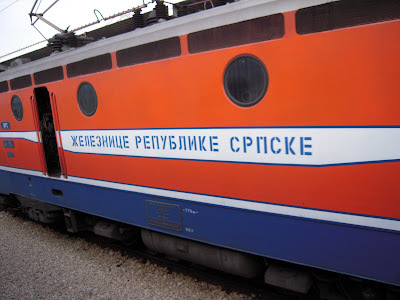 The Bosnian Serb Republic may well be one of the most diplomatically and economically isolated parts of Europe, somewhat more legitimate than the Transdnistran Republic, but destined to remain in a legal limbo as long as war criminals such as Ratko Mladic continue to take refuge there. It is also a center for the local style of roots music, the almost amazingly unmarketable sounds of Izvorno Zvuci music. This is the local style of fiddle-and-scream music based on the narrow harmonies of the Bosnian mountain singing instead of the smooth urban music of Sarajevo sevdah. 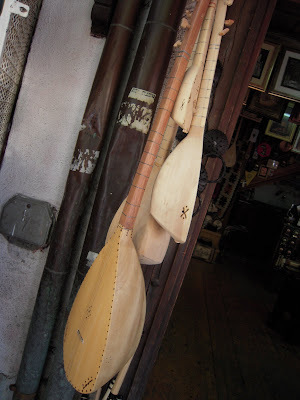 You see the crude hand carved sargija lutes - essentially primitive two course diatonic saz - for sale in a lot of Bascarsija shops. As far as the Izvorno sound goes, check out Youtube. My buddy Ben Mandelson tried to promote an Izvorno band on Globestyle records back in the grand blossoming of the World Music movement during the late 1980s: Kalesijski Zvuci: Breakdown: The Unpronounceable Beat of Sarajevo. The album set records for least popular World Music Recording of all time. As anybody knows, I am a sucker for wild, scratchy fiddle-and-scream music of all types, but Bosnian Zvuci is just about the limit for me. I mean, no way could I actually listen to this for an entire CD. Anlother issue is that there is an awful lot of strongly nationalist Izvorno music around, and when you get to where you can understand the lyrics it can be downright uncomfortable to listen to. But that's why we have youtube! And if you need more, just surf youtube, the lazy ethnomusicologist's best friend! Sarajevo’s distinctive little rolled cevapi are world famous - at least among former Yugos – but they are not the end of the line for cevap in Bosnia. Not by a long shot. The cevap made in Banja Luka, in the west of Bosnia, are a whole other universe of cevapoid pleasure, one that can divide cevap fans into partisan camps between two cevapdzinicas on the same street. Banja Luka is a city west of Sarajevo that wound up in the Republika Srbska after the Dayton Agreement ended armed hostilities in 1996. Today it is the de facto capitol of the Rpka. Srpska zone, and the once large muslim Bosniak population of the town was resettled into the Federation territories, many of them in Sarajevo. With them came the Banja Lucki cevap, a tight square of cevaps divided into four connected cevap and usually served with… gasp!... a hot pepper. The square shape, which peels off into four tender mini cevapi when cut with a fork, are ever so slightly different than the Sarajevo rolled method. You usually get three (a middle sized portion) or four( super size me to veliki, baby!) squares, loaded into a somun loaf that has been dipped into a greasy broth and then toasted on the grill, which keeps the whole serving warm and juicy while you eat it. The sides – onions and kaymak cream – are topped with a couple of small hot peppers. 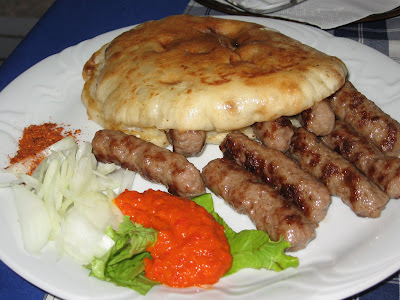 The end result is that the cevapi stay juicier when connected into one firm meat cake than they would if already divided into little turdy taste bombs, as in Sarajevo style. The meat mix may also include some lamb, or at least younger veal. 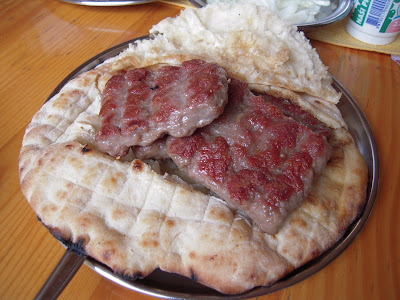 The discovery of the Banja Luka style cevapi made my life choices much harder in Sarajevo. Will it be Zeljo’s? Or Kastel? Or the Banja Lucki place that mixes hot pepper into the meat? How can I ever decide? Luckily, I didn’t decide. I ate them all. Banja Luka cevaps were usually a little bit cheaper in price than the cevap from the better known places, and one afternoon while hanging in Mirella's cafe the bartender ran down the street, bought a big take out bag of Banja Luka cevap, and then shared them out with the whole of the bar clientele - me, Fumie, and the accordion player. When I got back to Budapest I ran into cevap grillmaster Sinise from the Jelen Bar one night hanging with some other Serbian expat friends. One mention of Sarajevo sent them into swoons of nostalgia and competing cevap nostalgia for the two styles. 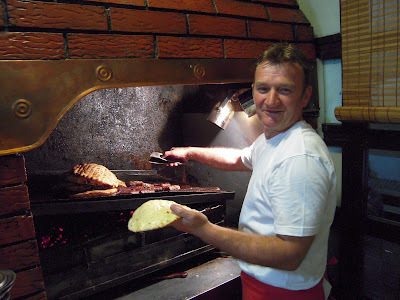 Even cooks from Belgrade and the Voivodina go into rapture at the mention of Bosnian cevapi. It mostly has to do with the quality of meat. Bosnia is mountainous and produces great beef and lamb. Most cevap is pure beef - slightly older than veal - and some is a mixture of lamb and beef. 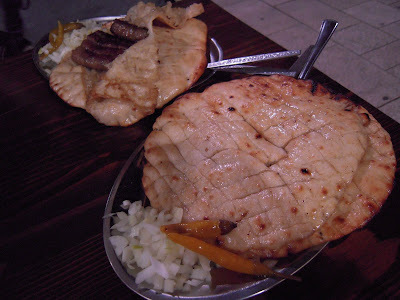 Serbian cevap from Leskovac uses pork in the mix, and as you get into Bulgaria you wind up with pure pork kebabche. 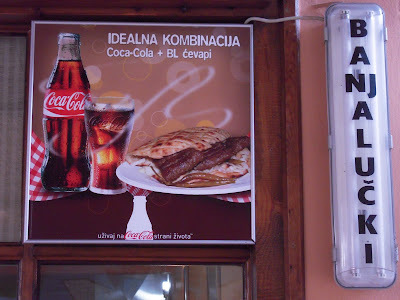 I personally consider Bulgarian kebabche to be just beyond the pale of enjoyable cevap… perhaps because I once got food poisoning from eating a bad one in Koprivshtitsa in 2001. 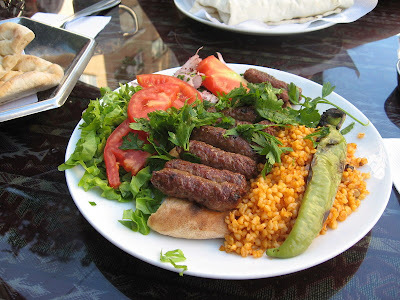 Which is strange since just across the border from Bulgaria you enter Turkey and suddenly the ground meat universe blossoms into the wonderful world of kofte… made of beef and lamb again. Balkan cooking is essentially a subset of Turkish cuisine, and often you will find an Ottoman era recipe tweaked into a pork dish that it isn’t possible to identify with the Turkish cuisine of the past. Greeks make souvlaki with pork, Bulgarians make kebab with pork, and guess what? It’s a political statement, not an improvement. Furthermore, pork falls apart when made into a meat patty, so you have to add binders like egg or breadcrumbs. Sticking with the beef and lamb traditions of Balkan Muslim cooking, Bosnian cevapi are some of the best of the best ground meatwads available in the universe. They are copied all over the Balkans wherever Bosnian refugees have settled, such as in Slovenia. I’m not even goung to attempt to discuss the hamburgeroid South Slav pleskavica here (which is one of the most searched items that directs readers to this blog.) Pleskavica is essentially a cevap patty that you can eat like a burger. If I am in Serbia or Croatia, yes, I will eat pleskavica. It is what I get at the Jelen and other Serb grills in Budapest. Budapest - lacking anything vaguely resembling decent beef - is a barren desert when you want a simple hamburger. In those cases you get yourself to a Serbian bar and order a pleskavica. But give me a good Balkan grill south of the border and I go for the cevap. Bosnia – keep my seat waiting. I’m pretty sure I’ll be back within the year.